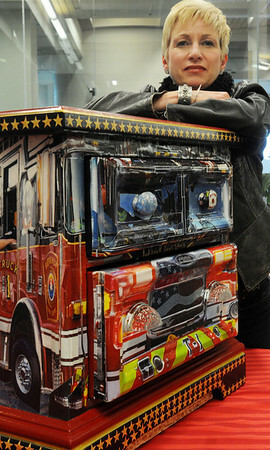 Katharine Shairs-Phillips with her painted chest commemorating the fallen 9/11 firefighters. The work is part of "The Treasures of Beverly," a display of public art throughout the city leading up to Arts Fest Beverly in June. Photo by Ken Yuszkus/Salem News, Tuesday, May 17, 2011.